Justine Bakker, of Rice University, has reviewed my book The Crescent and The Compass for the online academic journal Correspondences. Since the book was written for a broader audience — not for academia per se — I was surprised to learn that the site was interested in reviewing it at all. 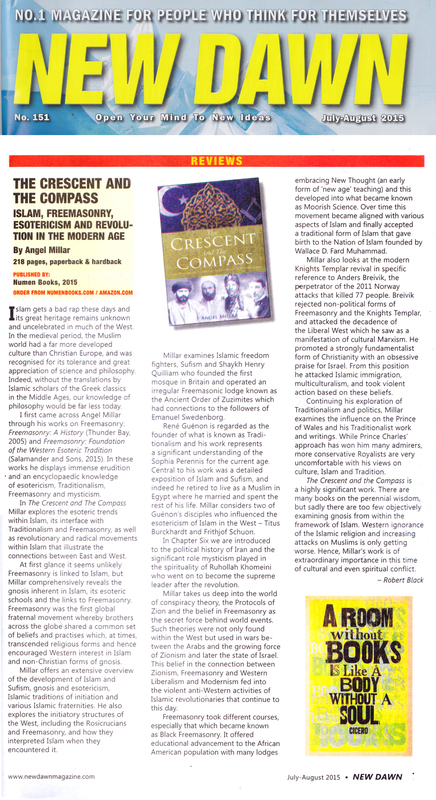 The excellent New Dawn magazine has reviewed The Crescent and the Compass in its July-August issue, calling it a “highly significant work.” You can read the entire review below. The Crescent and The Compass: Islam, Freemasonry, Esotericism, and Revolution in The Modern Age is available now! My third book, The Crescent and The Compass, focuses on historical connections between Islam and esoteric Freemasonry (and Western esotericism more broadly). Subjects include radical Muslim activists in the Middle East and how they tried to use Freemasonry to promote their political ideas; Rene Guenon, Islam, and Freemasonry; the fringe Masonic activities of Shaykh Quilliam; Ayatollah Khomeini and Islamic gnosticism; Prince Charles’s Traditionalist and spiritual understanding of Islam; and Islamist anti-Freemasonry and its role in terrorism today. I hope this book will be as revealing to readers as was my researches and findings to me. I’ll be saying more about the book soon, but if you’re interested in these subjects, please check out my recent interview with Occult of Personality. I discuss The Crescent for about ten minutes, starting at 42:55. The rest of the conversation was about my book Freemasonry: Foundation of the Western Esoteric Tradition, published by Salamander and Sons last year. I will be doing another interview with OoP solely about The Crescent, and will announce that when it is released. Purchase a copy of The Crescent and The Compass from Amazon.com. I received news today that Freemasonry: Foundation of the Western Esoteric Tradition is now available from Salamander and Sons. I believe the publisher is currently sending out pre-orders. Below is a photo of the book, taken by the publisher. On the left is the strictly limited, leather-bound edition, and on the right is the soft cover. The image on the cover is a detail of a painting (oil on canvas) that I painted circa 2008 — and, for those who are interested, some of my other, similar, paintings are currently on display in the (Masonic) Henry Wilson Coil Museum and Library in San Diego. Freemasonry: Foundation of the Western Esoteric Tradition, limited leather-bound edition (left) and soft cover (right). Inside of the leather-bound edition.